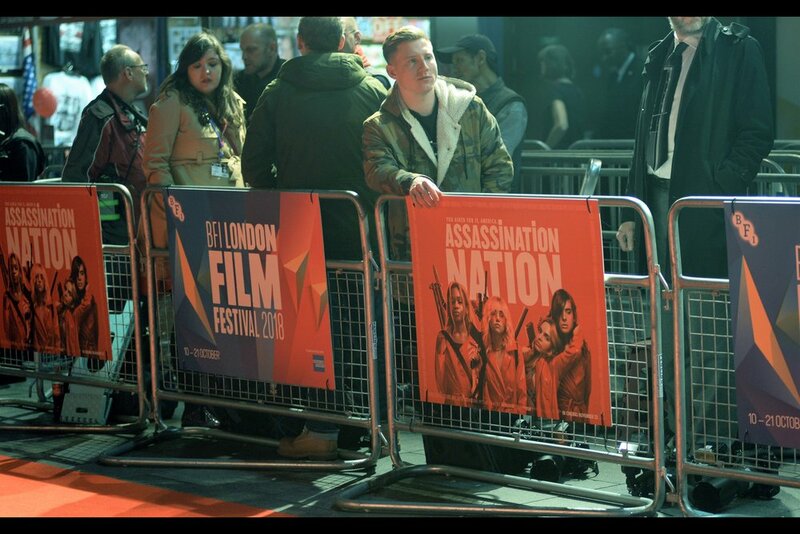 19 Oct - So this is a BFI LFF 'Assassination Nation' European Premiere? After the relatively early-in-the-evening premiere for ‘Can You Ever Forgive Me?’ with Richard E. Grant and Melissa McCarthy, I had a number of choices, including going home and getting a good night’s sleep. 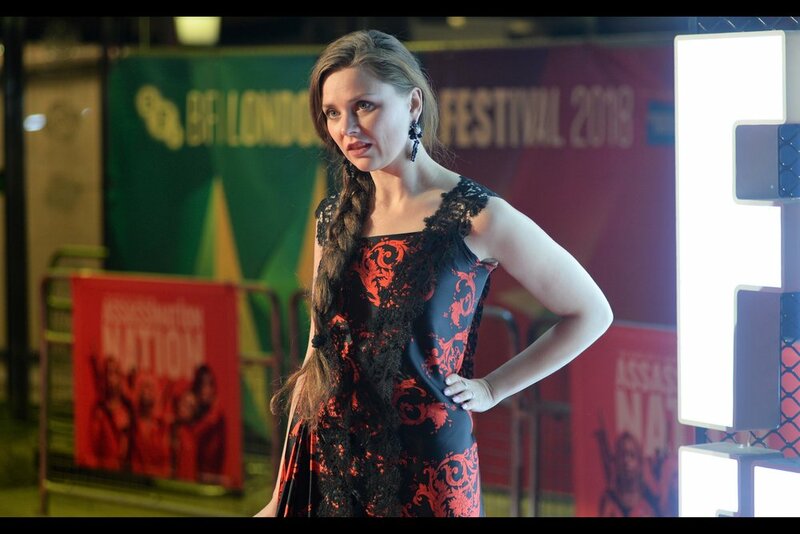 Instead, buoyed by a sense of optimism I can only punch myself in the face for having after all that’s gone down this BFI LFF, I stayed in town. It certainly looks pretty lit up and night. And the upbeat music actually kept Security dancing. It’s a list, and it contains no less than SEVEN names. For a late premiere on a Friday after a VERY long week… this is certainly something worth staying back in town for. EDITED TO ADD : only one of them is from this movie. The others… another movie? Backlit against the lightup stairs, I sadly missed photographing the silhouettes of a dancing security lady. Then again, maybe this above is some new dance craze “Tha Adminisitratah”? …. what else am I going to while waiting : make conversation with the weirdos next to me? Unlikely. Our first arrival does not come by car, and appears to not actually be in this movie. But the 90%-male paparazzi cordon seem amenable to photographing her. Is it a #TimesUp moment, or a #HoldOnLadyYouWoreThatAndCameToThePapsNotTheOtherWayAround moment? We have an arrival! And she came by car! And is on the list! And is in the movie! It’s Hari Nef, and per imdb.com, she’s best known for… being in Assassination Nation (2018). The matter of the The List Held By The Cute Girl Further Above clearly showed six more people from the movie is strange, as none of them are here, and no other cars have shown up…. Even more weirdly, Security (who up til now have been telling ticketholders not to linger on the carpet to pose for selfies and go into the cinema), have stopped doing so to coincide with what I can only call some kind of young group of yoofs, who are allowed to do seemingly whatever they want on the carpet. Are they cast? Crew? Of this movie or any other? Why are they allowed to cavort on the red carpet, and why did the photographers in the Paparazzi pen take photos of them accommodatingly but without any urgency? I metaphorically shrugged and decided to practice low-light photography to pass the time. Like … honestly…. who are these people? Are they cast? Crew? Randoms? Random others? Fully civilian? Why are they here? Why are the Paparazzi still here, and in some cases photographing them? Why are the Paparazzi even staying if only one person from the movie is here, and they’ve already gone inside? And why, in the end, did they go inside without signing for or interacting with anyone but each other? 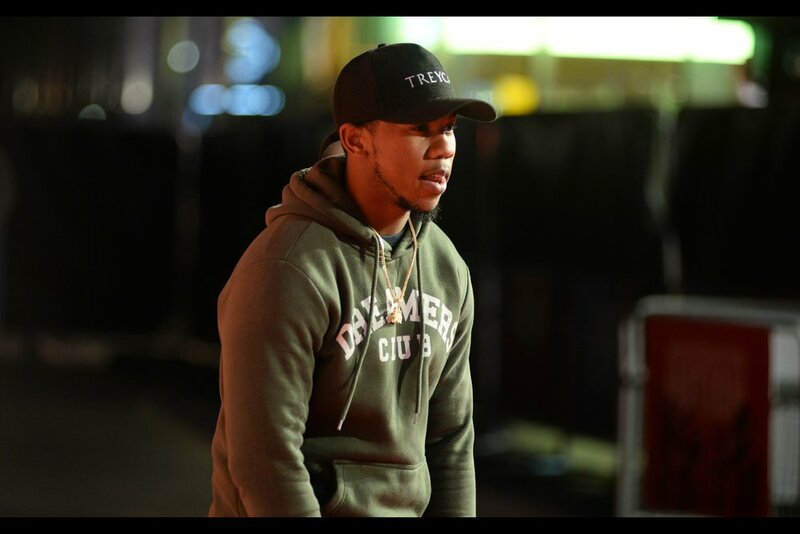 Are we being trolled by them… or the BFI…. or the makers of the movie? I f**king hate this. I hate feeling like I’m being made a fool of, and I don’t know why I let it keep happening, and I hate that every time one of several of my friends seem to go to a random event it turns out to be F&&KING AMAZING, and every time I take a risk I might as well ask a total stranger to punch me in the f%%king face for all the bother it would save me. I’d rather be in Italy, photographing the Rome Film Festival. “So… what the hell are we still doing here? ?” Their confusion is real. The anger is mine. I can honestly say… that I do not care. This lady’s look says it all : “What The…. ?” and the glowing white letter continues that thought. So that was… whatever the hell that was.